PINEHURST, N.C. (April 2, 2019) – History will be made this summer when Pinehurst Resort & Country Club hosts the 36-hole match-play final of the 119th U.S. Amateur Championship on two courses. Established in 1895 in the Sandhills of North Carolina, Pinehurst Resort & Country Club is a 2,200-acre property featuring nine outstanding golf courses, a nine-hole par-3 course, 16 clay tennis courts, an award-winning spa, other recreation and social activities for families, and elegant accommodations across one hotel and two inns. 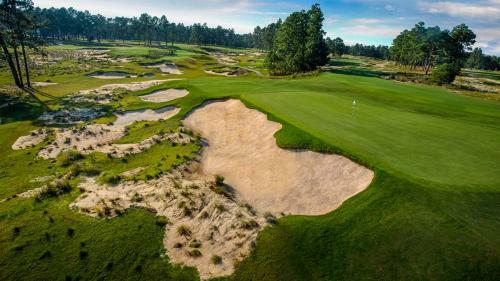 Widely known as the Cradle of American Golf, Pinehurst has hosted more single golf championships – including the U.S. Open, U.S. Women’s Open, PGA Championship, the Ryder Cup and PGA TOUR Championship – than any other site in North America. In 2024, it will again welcome the U.S. Open. The resort is slightly more than an hour from Raleigh-Durham International Airport, 120 minutes from Charlotte Douglas International Airport and only a half-day drive from many East Coast cities.